First off I'd like to wish everyone Happy 2004! Hope the New Year celebrations weren’t too rough? Well, since it’s been pretty quiet around here lately and maybe you’re stuck in front of the computer due to the crappy weather? stuck at work? or worse, injured!! I though you might enjoy some good quality reads to kill time. First of all I'd like to say sorry for not updating this site for a while, but there's some big changes going on with pinkbike.com and Drop In that have been taking some time to figure out. Another fantastic bike season comes to an end! To all our readers, volunteers, supporters and advertisers - BIG thanks for the support! 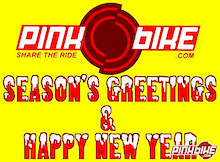 The entire Pinkbike.com team would like to wish you all the best this holiday season. Keep those wheels spinning, gears grinding and may the New Year bring you endless miles of descents! 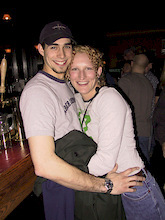 Merry Christmas & Happy 2004! See you on the trails! 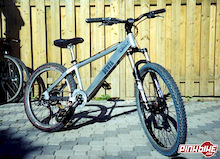 Bikes were stolen out of a North Van garage Monday night (Dec 15th). The thieves must have had a van or truck as cleaned him out pretty good. Brian lost 4 bikes 3 of which he would really like to get back. That's why he is offering a $2,500.00 cash reward for the successful return of the following 3 bikes. 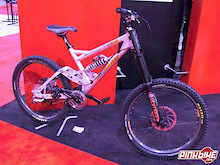 Most of you probably recall the rumors about Rennie and Vories signing with Santa Cruz bicycles? Well, the Santa Cruz Syndicate team is now an official thing!!! Here is the official press release. Enjoy! Sad news! 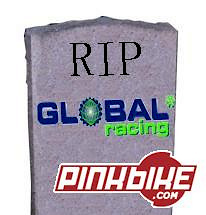 I was just read over on Velo News that the Global mountain-bike team has come to an end! Martin Whiteley who funded much of the team's expenses out of his own pocket, says he simply can't afford to take on that same financial burden in 2004. Well this might be old news to some, but since the distribution of these great magazines are somewhat "spotty" at the moment, just thought I'd let you guys know that you can now subscribe to them through their web site. 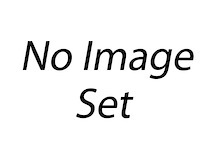 The USADA (United States Anti-Doping Agency) announced today that downhill pro Gary Houseman tested positive at the Grouse Mountain World Cup on July 12th. Alain Lavoie from Cycle A Bike has given me word that their Le Toy IV will be landing in America at the end of the month and should be available through their dealer in January. 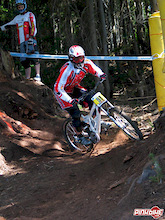 Cove Bikes has signed local prodigy Geoff Gulevich to a two-year contract. 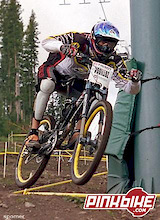 The 16-year-old up-and-comer will be the Cove’s freeride front man for 2004/05. Today, Smith Optics announced the hiring of Greg "Chopper" Randolph as their bike team and promotions manager. 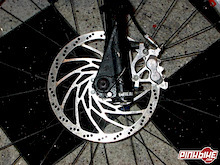 I remember "Chopper" from way back in GT's heydey and many of the articles he's authored over the years, most notably his view on the art of the wheelie. It's great to see Smith bringing Greg on board. Tioga has developed a new rubber compound claimed to yield lower rolling resistance, longer tread life, and great cornering performance. Someone finally stepped forward and signed young American talent Jill Kintner. 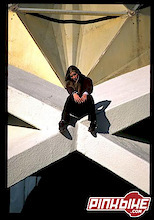 If you want to read more about it, check out Stikman's site at www.stiksandstones.com where it was reported yesterday. Via email yesterday, Jill advised she's excited about the Yeti sponsorship and looks forward to next season. Yeti is said to be holding on to this release until the rest of the team can be announced. Peugeot is gambling on a driver who has contested only 12 rallies in his life as part of its 2004 World Championship campaign. Nicolas Vouilloz, the 27-year-old former mountain bike world champion, will contest six rounds of the series in a 206 WRC, beginning with the Monte Carlo Rally. During his nearly two year hiatus from riding due to a badly broken arm, Noel Buckley channelled his energy and put his engineering skills to use to design what he wanted to be a compromise free, six inch plus travel freeride bike; the result was the Knolly Bikes 2004 V-Tach. Due to inclement weather (and a ton of it), Evil/e.thirteen has been forced to postpone its Customer Appreciation Event at Rye Airfield. The tentative reschedule date is January 26th. We apologize for the inconvenience. The last thing we need is a bunch of riders stuck in the snow throughout New England. With safety in mind, we feel this is the best decision. So for all that have been put on the guest list, mark your calendars. Tentatively, we've rescheduled for January 26th, same time, same place. We'll be in touch to confirm. See you there! Tomorrow night, the Sonar Night Club in Gastown will host the freeride community for the west coast premiere of Eastside Freeride "The Film". This new flick from northeastern North America is dedicated to reflecting the style of riding, riders, and the lifestyle of the Eastside: dirt jumps, DH, trials, urban, and freeride. One part local riders, one part big-name pros, mixed with killer music and smooth editing, Eastside Freeride "The Film" is grilled to perfection! Challenge Publications, Inc., a leader in biking periodicals, announced today the addition of two new editors. The move strengthens the current editorial team and supports Challenge's mission to be the number one niche biking publisher in the world. FastTimes Inc. Productions has pulled out all the stops to bring you its 2003 movie, ES2 – Fully Loaded. On Sunday, December 14th Bert 'n Ernie's pub (2205 Bloor St) will host the World Premiere of ES2 - Fully Loaded. Tickets are $10 at door and there's well over $5000 in prizes to be given away. They've also got over 3 hours of video footage on hand to keep the party rocking with Self Titled and Monkey Style 2. Well I had to share this little story with you! Being so close to the holiday season, this is as good as any Christmas tale out there! So without further addue, here is a sad story with quite a happy ending! BOULDER CITY, NV: Bootleg Canyon, which is being heralded as one of the best places to mountain bike in the United States, now has a dedicated shuttle for mountain bikers. The shuttle service operates Friday through Sunday from 8 a.m. - 4 p.m.
Alec Wohlgroth of halsundbeinbrunch film was nice enough to send me his latest release called “One Steep Planet”. Halsundbeinbrunch film consist of five freeriders, filmers and photographers forming one of the fittest filmteams in Switzerland! Let’s face it, there’s no real shortage of mountain bike film producers in the game these days. Your selection can vary from rough digital video footage of locals ripping their best trails to 16mm film footage of the world’s best riders shredding the most exotic locales. That’s quite a range. Some obviously appeal to a more “local” market, while others are eagerly awaited by (dare I say it?) the entire industry. It's safe to say that’s where Freeride Entertainment fits in! Norco Performance Bikes, one of North America's leading producers of high quality mountain bikes, components, and clothing, is proud to announce that Quebecois Down Hill Champion Hugo Donais will be flying the Norco colours once again in the Men's Pro/Elite category. 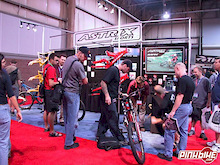 Tucked away in the back corner of the Sands Convention Center alongside the likes of Nicolai and Evil bikes, Interbike revellers could find relative newcomer to the bike game Astrix Sports. Founded just a few short years ago by Ryan Carroll, a mechanical engineer whose day job (until Astrix) was designing skis for wingnuts like Shane McConkey. An avid cyclist, Carroll spent his hours not at work developing Astrix' line up using rider feedback and straight up engineering know-how. A formula that's worked in the past, I can't think of why it wouldn't work here? Looking for the Perfect Suspension Setup? Look no Further! 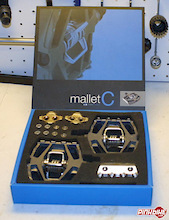 Bicycle suspension junkies rejoice! Push Industries, located in Irvine California, opened the doors to the Mountain Bike Suspension Center today. Leave it up to a company that lists Ferrari as one of its influences to come up with a product as fuctional as it is funky. It’s hard to argue against the fact that Crank Brothers has come up with some of the most unbelievably useful and yet equally beautiful cycling components in years. 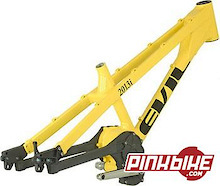 Evil Bikes Has a New 2013i (G-Boxx) Page up!! While doing my little morning ritual of going through my extended list of MTB news sites, I noticed that Evil has a brand spakin' new page up for their Evil 2013i G-Boxx bicycle, which contains tons of detail info on this much anticipated bike. So what are you waiting for, CHECK IT OUT! Just in time to stuff those stockings comes your choice of 2 stellar 2004 calendars. First up is the North Shore Odyssey; featuring stills from the sport's best shooters including John Gibson, Derek Frankowski and Ian Hylands this one's a winner. Then there's the Johnny Waddell Calendar. Coordinated by Johnny's close friends, the industry's best photographers have graciously donated a multitude of shots to the huge, double size format calendar where all proceeds go to benefit Johnny's family during his recovery. And, just to make sure that stocking's stuffed full, we'll be adding some Pinkbike stickers to all orders received before Christmas. Visit the store today and support your favourite mountain bike web site and a great cause while you get that Christmas shopping done! 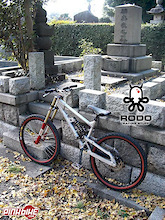 RODO, from “The Land of the Rising Sun” (formerly Namaiki Cycles) has just released several photos of their prototype downhill/freeride frame. The RODO LO-8 eight-inch travel, rising rate walking beam-equipped bike uses a ‘parallactuated system' link-to-shock configuration - details of which are rather hush-hush at the moment. 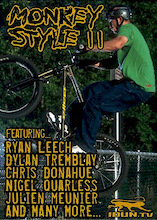 Monkey Style 2 Calgary Premiere! This Saturday. This Saturday at Murray Fraser Hall Room 162 at 7:30 will be the Calgary Premiere of IDUN's own movie, Monkey Style 2. To get in it's $10 for the guys, $5 for the girls. ($5 for guys dressed as girls) The movie features a few Calgary locals such as Doug Fink and Jared Jesperson and the possibility of a few others. So come on out and support your local riders. I just received word through a few people that Stephanie Nychka, one of Calgary’s best female riders has recently lost her fiancé Joel Demoskoff. Joel passed away from natural causes. He was one of Calgary’s top dual racers, a friend to everyone, and full of life. He will be missed by all.